What are the best words to use in a headlines and titles? How many words should a title contain? What makes the best title? You may be surprised what science shows are the answers to these questions. Here’s how to create the best title based on scientific research of over 1 million articles. Whether you’re writing a blog post or a thousand page book, the first few words are the most important. Just because most people get 2 clicks for every 10 people that read their titles, doesn’t mean you have to be satisfied with those results. By investing just a little time into your titles you can ensure that more than two people click out of every ten who read your title. Upworthy, one of the fastest growing media sites is famous, or maybe infamous, for their eye grabbing titles. Upworthy’s co-founder Peter Koachley found that traffic directed to content on their website could vary by up to 500% based on the title. So how can you make your titles perform like Upworthy’s? I analyzed the 10,000 most shared articles for common words used in titles. I totaled up how many shares all of the 10,000 articles received over the past twelve months and ranked them based on the most shares. I was able to find the 10,000 most shared articles by using BuzzSumo. BuzzSumo enables you to analyze what content performs best for any topic or competitor with their social analytics tool. Below you will find the 15 most shared words in titles. Titles with numbers were by far the most shared with almost 2 billion shares of articles where titles included a number. “10” is the most shared number with 26% of all articles shared that included a number in the title having the number “10”. Another interesting finding was that titles using the number “10” were shared eleven times more that articles using the word “ten”. Noah Kegan did a similar study analyzing a million blog headlines and found that list posts using the number “10” were shared four times as much as the second most popular list type of “23”. In third and fourth place were 16 and 24. Kegan’s study also found that list posts only made up 5% of the one million articles analyzed. Even though the power of the list post is common knowledge, content creators tend to shy away from using this tactic. The title does not change the quality of your content, it simply plays an important role in how many people will read your content. Titles with the word “you” were the second most shared with slightly over a billion. We may not like to admit it, but we are self obsessed; the numbers don’t lie. So You Resigned From Teaching. Now What? Titles with the word “what” were shared slightly over 650 million times. Titles with the word “what” combined with the word “is” made up 37% of those 650 million shares. What Are Some Steps To Keep Your Workers From Getting Ill This Winter? What Is the Difference Between Digital Strategy and Digital Marketing Strategy? Titles with the word “will” were shared almost 500 million times. Titles with the word “will” combined with the word “make” made up 21% of those nearly 500 million shares. Titles with the word “how” were shared slightly over 450 million times. Unsurprisingly, titles with the phrase “how to” made up 51% of those nearly 450 million shares. Titles with the word “new” were shared slightly under 450 million times. Titles with the word “why” were shared slightly over 300 million times. Titles with the word “best” were shared slightly under 300 million times. 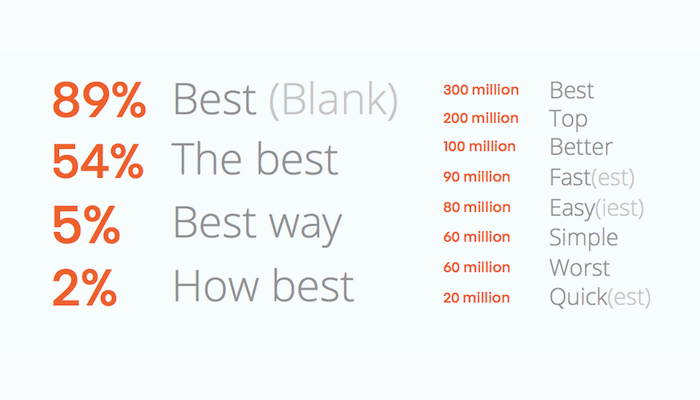 Titles with the phrase “best (blank)” made up 89% of those nearly 300 million shares. Titles with the word “science” were shared slightly under 300 million times. Titles with the word “should” were shared slightly over 200 million times. Titles with the words “should” and “you” made up 53% of those nearly 200 million shares. Titles with the word “know” were shared slightly over 200 million times. Titles with the words “know” and “you” made up 68% of those nearly 200 million shares. Titles with the abbreviation “vs” were shared slightly under 200 million times. On the other hand, the fully spelled out word “versus” received less than ten million shares. Marketing vs IT: Who Drives the Customer Experience? Titles with the word “never” were shared slightly over 150 million times. People say that “free” is the most powerful word in selling. As titles go, “free” is the fourteenth most powerful word in selling. Titles with the word “free” were shared slightly over 150 million times. Titles with the word “stop” were shared slightly over 150 million times. Stop Using These Words In Your Emails! Want to Hire Great People? Stop Asking Stupid Interview Questions! Here’s how to create the best title based on scientific research of over 1 million articles. How Many Words Should You Use in Titles? some guidelines you can follow to increase your odds of success. On average, people give a headline less than a second to grab their attention. Eye tracking studies from The Poynter Institute and user experience research from KISSmetrics show that people tend to scan headlines. When people scan headlines they only read the first three words of a headline, so you have to make sure those first three words instantly grab their attention if you want them to pay attention to the rest of the headline. Interestingly enough, the research also found that if the first three words grab someone’s attention, their eyes tend to skip to the last three words, so you have to make sure those last three words close the deal and get people to consider clicking your headline. The eye tracking studies and user experience could lead you to think that headlines should optimally be six words, but websites like Buzzfeed and Upworthy owe much of their success to the use of long titles that are on average 15 to 20 words long. Neuroscientists at Nielsen Neuro found that longer headlines drive more engagement. Specifically, they found that 21 to 28 word headlines drove the highest engagement. If trying to optimize human behavior isn’t challenging enough, then you’re in luck, because you also need to consider constraints when choosing the length of your title. The first constraint is Twitter. Your headline should be 89 characters or less if you value clicks from Twitter. 89 characters leaves enough room to have a shortened URL and image in your tweet and a space between the URL and headline. The next bar is Google. Your headline should be less than 55 characters to fit in Google search rankings. If your title is longer than 55 characters you should ensure that the first 55 are descriptive enough to motivate people to click or make the title tag different from the main headline. You can also make your titles different for each social media channel using different titles in the meta tags that are unique to each social media tool. Writing great titles is like being a great NBA three-point shooter. You have to take a ton of pre-game practice shots to hit the game-winning three-pointer. Upworthy writers create 25 titles as fast as possible for each article they create. It was an exercise that originated from another news site known for attention grabbing headlines, The Onion. Advertising legend David Ogilvy rewrote one of his famous headlines for an automobile advertisement 104 times. What Are the Best Words You Can Use in Headlines? Then I like to choose the one that I feel will drive the most traffic and crank out at least 10 variations of that to see if there is an even better variation. In this example, I chose “How to Write the Best Headlines”. While creating these variations, I use Google Adwords’ Keyword Tool and Buzzsumo to see how different variations of individual words perform. For example, you can see that I was originally using the word “headlines” in my titles for this article but then I saw that the word “titles” does much better. “Headline generator” is the top Google keyword related to my article. Using the word “headline” generates 2,400 searches a month. I compared that to the top Google keyword related to my article which was “title” and found that “title generator” received 14,800 searches a month. That is over six times as many searches for “title generator” than “headline generator”. As you know, my article is not about title generators, but that is the highest ranking keyword that relates to this article. Lower ranking keywords showed the same trend, demonstrating that more related searches are done including the word “title” than “headline”. I then did a similar search in BuzzSumo and found supporting trends for social shares. Hubspot had an article that included the word “titles” which got the most shares over the last twelve months at 14,900 shares. On the other hand, the most shared article using the word “headlines” only received 2,700 shares. This article happens to be from Hubspot as well, so I felt pretty confident that I should use the word “titles” over “headlines”.